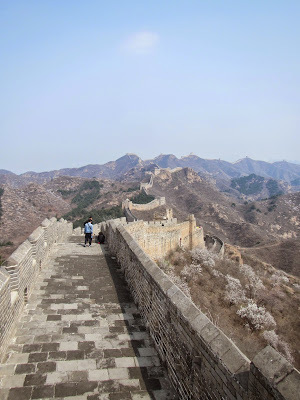 A Travelling Educated Redneck: My Solo China Trip: Beijing/Great Wall "PART IV"
My Solo China Trip: Beijing/Great Wall "PART IV"
6am came sooner then necessary, but it was expected as I had grown quite accustomed to early morning wake-ups. I checked out of my dingy hotel and headed straight over to their little attached convenience store every establishment seemed to have. I loaded up on bottled water and "Lime Lays chips" and headed over to the bus station a few blocks away assuming I had it all figured out for my 8am bus out of Tangkou. Boy was I wrong. I made my way to the bus station help desk avoiding the long line of tourists waiting to board the scenic bus up the mountain. I anticipated a battle getting my question across in a coherent manner, and man, do I hate being right. I handed the lady my ticket and used my Oscar like skills to act out my confusion on where I was to board. She looked at me with a muddled expression on her face. She handed my ticket over to the other lady sitting beside her who also proceeded to glaze over with a perplexed expression. I knew the language barrier was just another hurdle I needed to overcome, but I needed to persevere. They returned the ticket back to me while talking in a flurry of Chinese, expecting me to understand every word they attempted to convey to me. I instantly got that anxiety feeling I was slowly adapting to. I was taking it all in, calculating all my options while in the background, the undecipherable concerns were being spewed at me. Thankfully, a travelling local beside me knew a snippet of English, and took this time to intervene. She took the ticket from me and looked at it for a while. She said something in Chinese to the two ladies, then waved at me to follow her. I was keen on complying as any progress getting me on that damn bus was paramount. We left the bus station which I thought was a bit odd, but that was not the end of it. We continued down the street and back into town. I started to feel a bit guilty that this lady was spending so much time helping a misplaced tourist like myself. We turned down another corner onto a familiar street, and that's when it dawned on me what was going on. It was further clarified more clearly once the helpful lady talked to the same lady I dealt with at my hotel. The ticket was assigned to me by the hotel, which in turn, was the actual place I was to wait till boarding time. Wow, good to know. So I sat there in the lobby for the remaining 45 minutes, at which point, the same front desk lady concluded her conversation on the phone and waved at me to follow her. This seemed to be my new standard operating procedure at getting around. So I did just that and found myself following another lady down the street. She took me to the main drag near the large KFC where there was a bus waiting. I got on, and we were off! There was no way I would of figured this on my own if it weren't for those 2 ladies going that extra mile to help me out, and it was once again greatly appreciated. The 5 hour journey was conducted on one heck of an impeccable toll road. Dozens and dozens of tunnels gouged through mountains were observed, twinned lanes elevated above the narrow steep valleys…it was all quite impressive. After a quick pit stop mid-way along the freeway, we arrived to a very wet and cloudy Nanjing. Rain welcomed us as we pulled into an alley that looked to be in the middle of no where. Everyone disembarked the bus at which point I once again found myself following the crowd hoping the Nanjing South Train Station would reveal itself in some miraculous way…but it did not. Everyone scattered to several small tent-like structures, doing their best to elude the rain that was now coming down in sheets. Even under one of these sub-par tent tops, I found myself still getting wet. I needed to get to the train station…and fast….but how. Nothing suggested a transportation hub, and what was worst, all the passengers had either private transportation, or were running off to some alley. I had no answers, and decided to see where everyone was heading. I followed the crowd to a taxi cue. Now what was my plan? I first needed to know where the heck I was. My previous research told me I was suppose to unload beside my desired train station, but I saw nothing! I began to get a bit stressed as I didn't want to just get into a cab and hope for the best… I've learned over time to expect the worst when it came to this pesky language barrier I've been forced to battle these last few weeks. I asked several passengers passing by, asking if they knew any English, with only blank stares returned. Frustration began to build within me from something so simple as getting from point A to point B, consuming much of my mental energy. I had no choice but to continue to question random strangers as my gear and I got soaked. Finally, a younger businessman understood my solicitation and asked to see my desired destination on paper. I showed him and he looked at me in a foreboding manner. "It's really far" he uttered. He took my paper and wrote my destination in Chinese, and also told me what I should expect to pay in cab fare…45 yuen. Once again, saved by a random stranger. Fully saturated at this point, I boarded the next taxi in cue, and 30 minutes later, I arrived at the substantially sized Nanjing South Train Station. I paid the cab driver 45 yuen, (EXACTLY what the helpful stranger guessed), and prepared myself for the multi-step process of boarding the "G" bullet train I was quite determined to experience. I first had to line up to pick up my first class ticket ($150 CAD, best value in my opinion, business class was almost double). Next, I needed to line up to have my luggage x-rayed for security risk. Once that was done, I needed to find my "waiting hall" to board. After that was done and the train arrival time was nearing, I needed to scan my ticket to enter the train platform, followed by lining up at the correct train car to board. Once boarded, I needed to decipher the ticket to figure out what seat I was in. Wouldn't you know it, I was given an aisle seat with a window partition right in my view. I was having a hard time containing my disappointment, but it was what it was, and I needed to move on. The ride was smooth, with a top speed of 309km/hr reached. I found it much more enjoyable leaving my seat to watch the countryside from one of the exits at the end of the train car. It was quite smoggy, but I thoroughly enjoyed experiencing the unfamiliar landscape wiz by. Only 4.5 enjoyable hours later, we arrived into the South Beijing Station, stop free. It was quite easy exiting the train station as everything was printed in both Chinese and English. I paid 6 yuen and boarded the subway which was also very user friendly. A few stops later, I reached my Dongi Station, eager to check into the Park Plaza. 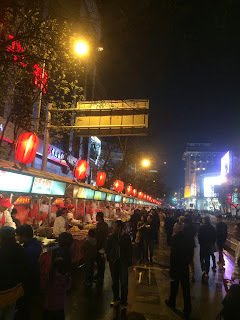 I exited the subway which spit me out onto Wangfujing Street, a road I had no experience with. Instead of being welcomed by my stereotypical ideas of old word Chinese culture, I was instead overwhelmed by what could only be described as Las Vegas style glamour and lights. Bright lights and lavishly pretentious shops littered the street, with American based restaurants sprinkled here and there. I instantly let down my guard as I was taken back with the unexpected sites. I also noticed for the first time, overseas tourists almost outnumbered the locals, and as I tried to get my bearings straight, a young couple approached me. Their English was remarkable which caught me a bit off guard. They asked me where I was from and where I was going. I was turned around a bit, and like the previous corners I was backed into, I took their willingness to help as a godsend and told them Crowne Plaza. They pointed me in the direction I was to go, and then followed it up with desperate pleads to go have a glimpse at their art collection in support of their community. I instantly clicked back over to my more usual guarded demeanor and started to head towards the direction they pointed. They followed me for 5 minutes until they were content they could not make a dollar off of me, noticing my tunnel vision in action. I needed to remind myself once again that I was in a major tourist hub, and couldn't rely on trust alone as I had done the previous 4-5 days. As I approached the hotel, something didn't seem right…it looked different. I saw pictures of my hotel and this was not it. I stood there trying to figure out where I went wrong. "You have got to be kidding me"! I stood there almost embarrassed as reality dawned on me. I had mistakenly printed Crown Plaza instead of PARK Plaza. The good news was it was only 2 blocks out of the way. I made my way down a few back roads wondering if I was the only one who had made this silly mistake. Like really…they almost sound the same! I finally arrived to my correct hotel that was exhibiting familiar traits gained from my research inquiries, while noticing the Starbucks across the entrance that so many previous customers had praised about. I then checked in for the 4 nights and made my way up to my upgraded room which was suppose to be an upper room with a view. Well, I'm not sure how the 9th floor was upper in a 16 floor hotel, but I sure as hell did not have a view. I was almost ready to head down to plead my case, but decided against it when I remembered I needed to keep my heart rate down. 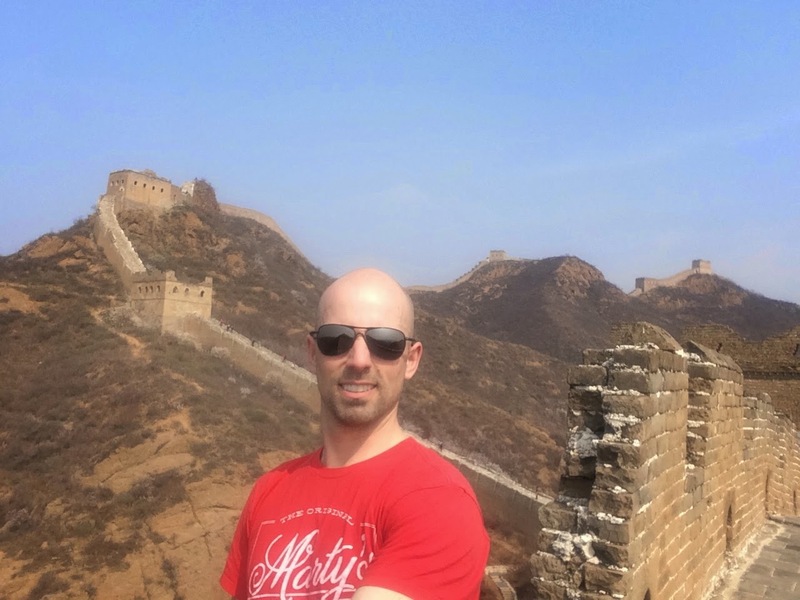 Crazy as it sounds, I had purposely refugee'd myself to China to get away from the craziness that was being played out in my personal life back home. I decided to take in a few English TV shows before calling it a night. Once again I was awake bright and early. Today I was going to walk the kilometer or so it took to Tiananmen Square. 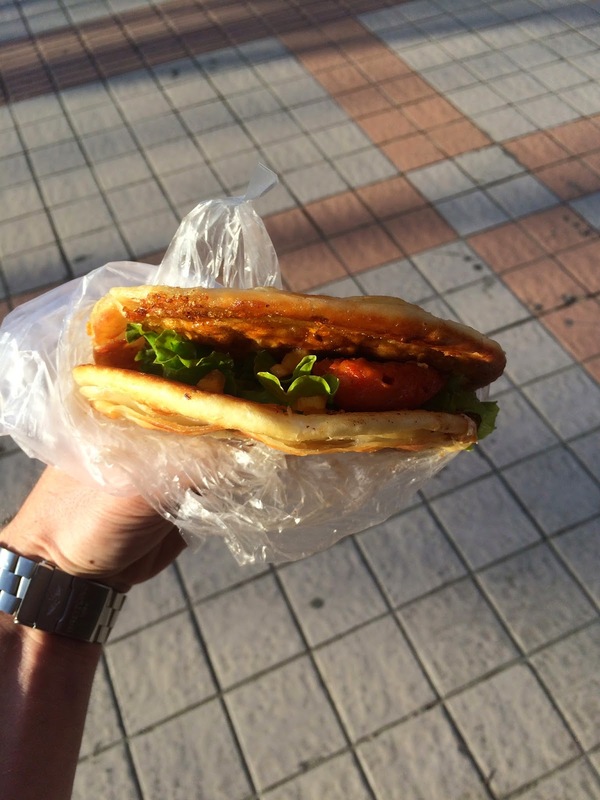 On my way, I stumbled upon a wonderfully looking street vendor concocting a scrumptious looking egg chicken wrap. 7 yuen later, I continued on my way very satisfied with my breakfast, hoping I would have the fortune to stumble on him again the following morning. The walk was easy as I made my way down the empty Wangfujing Road which was previously packed and lit up the night before. The air was crisp and cool, and the few braving the early conditions seemed to be quite bundled up, but it seemed my t-shirt was sufficient enough for me. 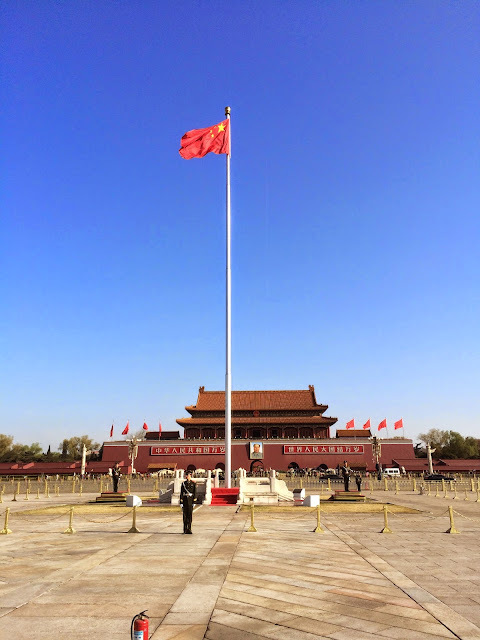 It wasn't long before I identified the massive Tiananmen Square across one of the busy streets off in the distance, as well as the neighboring Forbidden City on the opposite side of the street. I decided to tackle the free Tiananmen Square first, taking the tunnel under the bustling street. I was able to forgo the x-ray machine as I had no bags on me…always better to travel light. Tienanmen Square was abnormally huge and expansive for something that was located in the middle of a mega city. I wasn't able to beat the dozen or so tour groups already on site, but there was more then enough room for all of us. 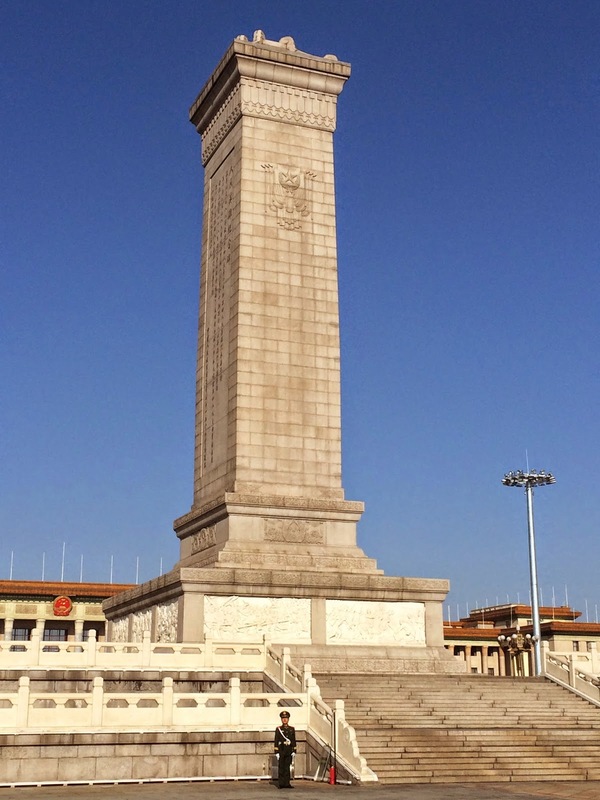 I took some selfie pictures, and several pictures of the poised soldiers standing in front of a few notable monuments before making my way over to the much talked about Forbidden City that I'm sure every single tourist sees when coming to China. Security was noticeably more stringent once I made my way through the first outer court, which then led me through an empty courtyard that had nothing really noteworthy. I walked through a second grand door which took me into a second courtyard similar to the first, but maybe just a bit bigger. Note: My disclaimer...my descriptions of the Forbidden City may be a bit inaccurate as the place is a jumble of courtyards, temples, and corridors...really easy to lose track which corridor was which, which temple was which. The second courtroom entered was where tickets were needed to be purchased. I lined up in one of the 15 or so lineups, each having roughly 50 or so people. I cringed at the foreseeable time this would take, but surprisingly it went fast, and before I knew it, I had my 60 yuen ticket in hand ready to enter another large door into the many inner courts. As everyone shuffled their way in like a herd of cattle, I strategically positioned myself to avoid the crowds by hovering out in the perimeter, aiming to capture a better angle of the considerably sized courtyard, but felt I did not succeed in my attempts. I snapped a picture of the Golden River Bridge before bee-lining my way into another courtyard. That was the theme of the day…courtyards and more courtyards. Each had their own unique central building…hosting a variety of stories and possible folklore based around the Ming dynasty and emperors. 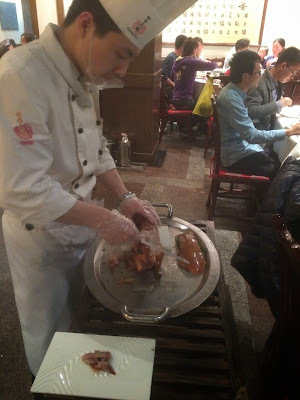 It was well laid out for both English and Chinese, and I was quite glad I did not fork more money out for a tour. I grew tired of the repetitive history I was becoming quite familiar with, but succeeded in seeing some pretty cool sculptures (I particularly liked the dragon turtle!). I entered through another grand door, finishing my quick tour in the Imperial Garden…my favorite. 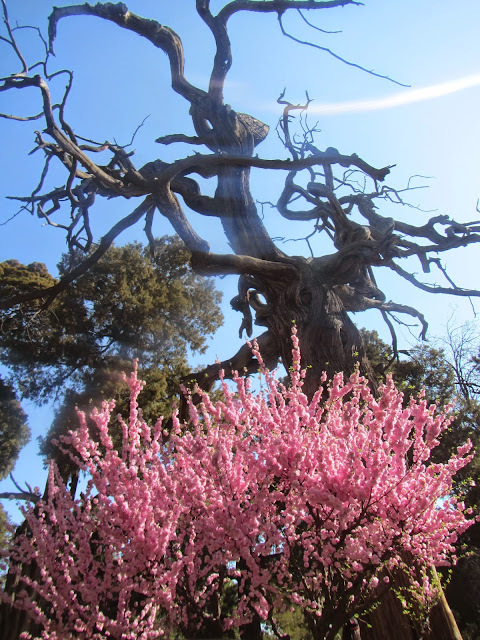 The Imperial Garden was the furthest courtyard from the main entrance, and exhibited dozens of preserved ancient trees, some needing braces to hold their weary branches. It was quite beautiful, and I was able to envision the peaceful tranquility the royal family enjoyed. I finally took time to relax and slow down in the serene environment, when I noticed something off in the distance. Up on a large hill outside the Forbidden city, was another temple imposing itself down onto the surrounding park…Jingshan Park. I immediately knew I needed to see the view from up there, and proceeded to exit the Forbidden City. 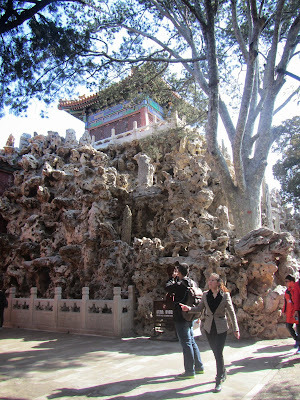 The entrance into the park was extremely cheap, only 10 yuen! The grounds were lush and dense, and if I had the opportunity to spend the entire day there to take in the serene sites, I would of easily stayed for hours taking in the serene sights, watching the locals play Erhu's, badminton, a form of hacky sack, and tai chi, but I was determined to get to the top of the hill to see what the view could offer me (I guess I was never one to stop and smell the roses, something I'm working on). As I reached the top, I was blown away on how lucky I was. 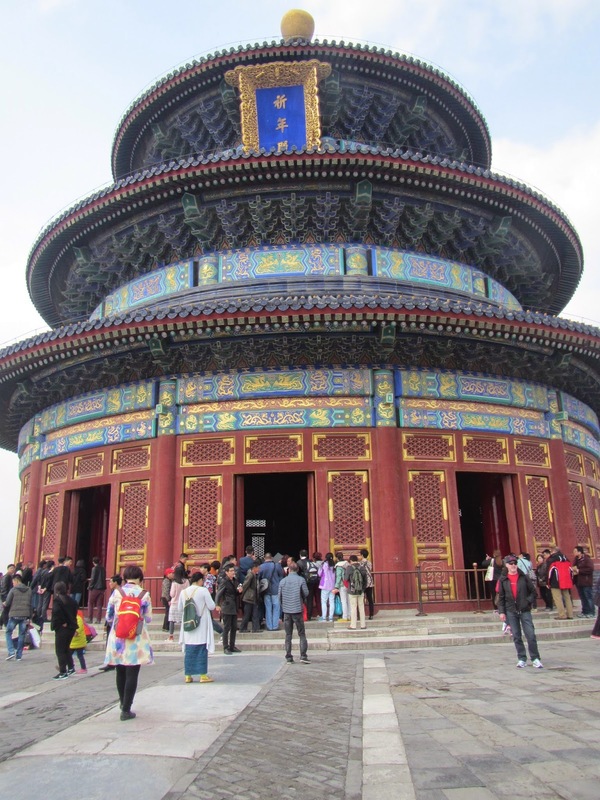 Standing on the temple's ledge, I was able to see all of Beijing smog free! The city was immense, and I loved every second I had trying to recognize every landmark the 360 degree view gave me. Once I was content I saw all I needed, I made my way down the hill and exited one of the smaller side gates. Tienanmen Square from the top of the hill, the people below put into perspective the size of the place! I decided to continue my walking tour along the Hou Hai Lakes, periodically dipping into a few bustling hutongs to see what commodity was being aggressively pursued and bartered. The walk was long and exhausting, and I began to grow fatigued at all the walking I was undertaking. On top of that, the popular region appeared to not be in full season swing, with the majority of lounge patios packed up for the winter. Aside from the hutongs, I was a bit underwhelmed with the entire slog up the lake boardwalk. When I finally reached the end of the lakes, I found myself with sore feet and a nagging appetite for something sweet, so I decided to grab some fresh strawberries from a road side cart and jumped onto the subway to make my way back to the hotel for some much needed r and r.
I grew restless in the hotel as I usually did after relaxing more then a few hours. It was 3pm and I felt I had just enough time to knock off one more tourist attraction before the day was done. 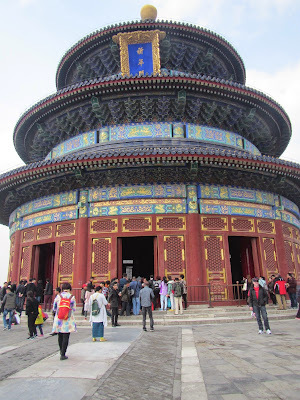 The Temple of heaven was one of those top attractions you always hear about, so off I went jumping on the subway again, and less then 30 minutes later, I found myself at its gates. I mistakenly paid for an entrance ticket AND map due to not having any idea what the ticket lady was saying. I gave away my expensive useless map to a stranger and headed straight to the main temple. It was big... I guess, but to me, it was just another temple with the same story. I took in the sites, walked the garden, and in under 1 hour, I had grown tired of the attraction and left wishing I had left that one off the list. Lesson learned. After a quick subway ride back to the hotel, I freshened up before heading to Wangfunjing Rd for a quick bite at one of the mega malls lining the street. Apparently, history shows when traveling, I get a hankering for white chocolate (had many white chocolate ice cream bars in Japan), and once again I did not disappoint, inhaling two white chocolate magnum bars to finish my dinner guilt free. Making my way back to the hotel to get some much needed rest for my 10km Great Wall hike, I stumbled upon the world famous night market. 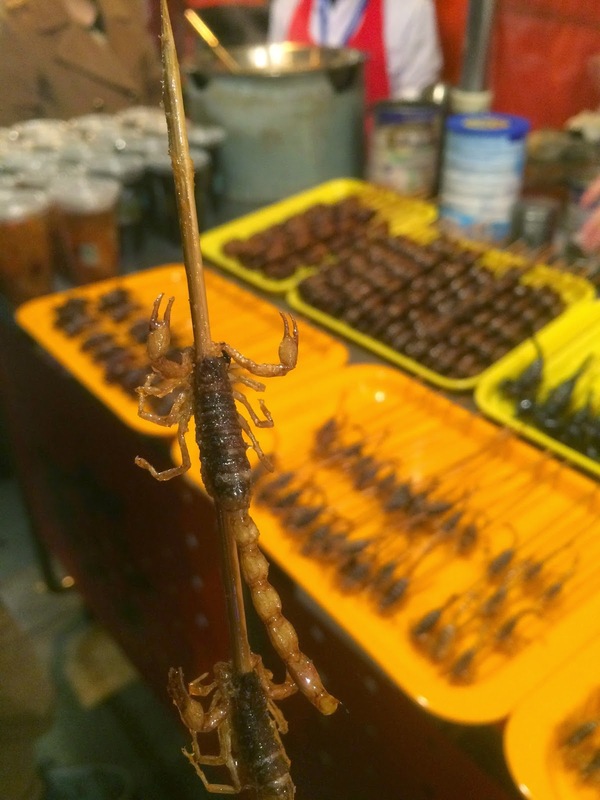 The much publicized market was world renowned for having many treats on a stick including squid, grubs, seahorses, scorpion, and starfish. 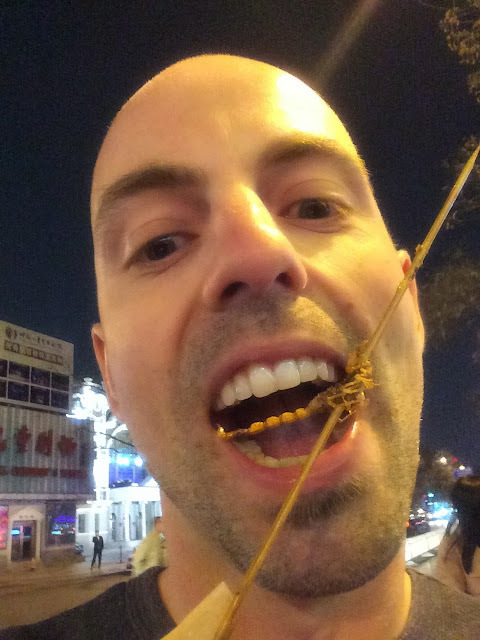 I took this opportunity to check off a daring food challenge to myself by consuming 3 scorpions on a stick. Surprisingly enough, they were quite tasty, and as I left, I gained a sense of pride, knowing I had pushed myself to taking a risk in trying something different and daring. My bed was welcoming after packing a ton of sites in only my first full day in Beijing. 7am came quick, and in my groggy state, I jumped on the subway to the Backpacker Hostel a few stops away to meet my fellow travelers at 8am. I was early and I had some time to choke back a discussing breakfast wrap as everyone slowly made their way in. This allowed me the opportunity to meet everyone at a relaxed controlled pace. I met an older couple from Cleveland, a younger couple from New Zealand, and a younger couple from Toronto…yes, all couples:( We all boarded the 25 person capacity bus and headed out for the 3 hour drive to the wall. Unfortunately, we were traveling on a shoulder holiday weekend, which resulted in us tackling bad traffic. We also had one of those drivers who strategically tried to avoid all the congested routes, you know the driver… gets anxious on one freeway, tries a side road just as he notices the freeway beside him picking up. Then he re-enters the freeway only to be gridlocked for another hour before trying another back-road. This went on for hours which began to drive me nuts, but I at least had a consolation prize through this ordeal..a front seat to myself with a view. Once we finally reached the Juyongguan section of the wall, it was already 1:30pm! We were given the option of taking the complete route offered which added 5 towers for a total of 22 towers, or to take the short cut, only allowing 17 towers to be completed. The tour guide strongly recommended we took the shortcut as time was an issue with the gates closing at 4:30. Naturally, I took the long way, wanting to see as much as possible. A few others also braved the extra distance as we quickened our pace to ensure time would not be an issue. The delay from traffic actually became a godsend. 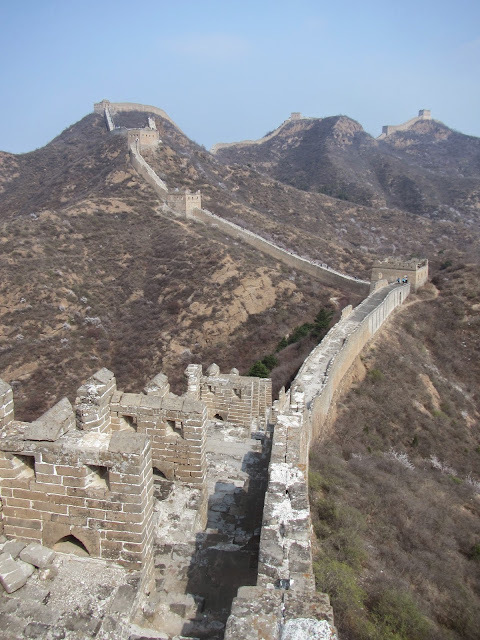 The wall was uncharacteristically quiet, a happy surprise resulting from all the tour groups already having left. 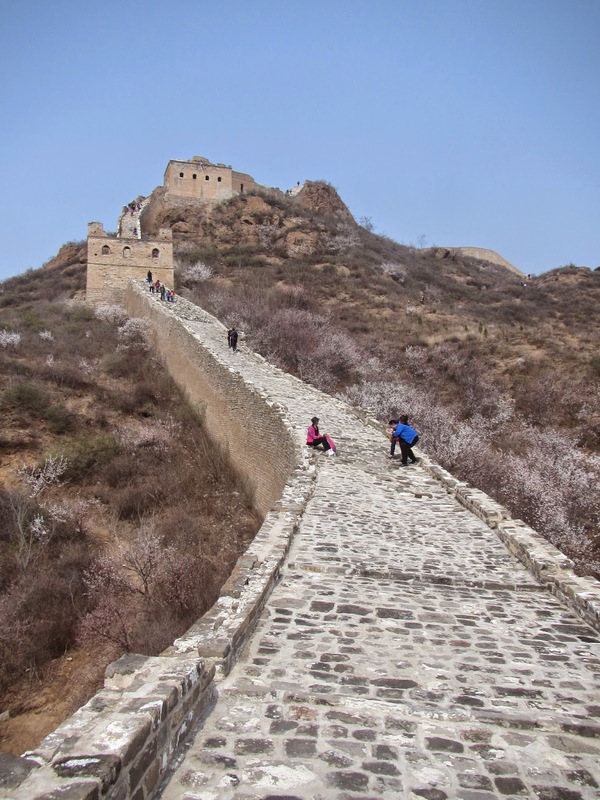 With minimal smog, very few tourists, and plum blossoms blooming, I knew I was fortunate enough to have the privilege to experience the wall in its full grandeur. I continuously reminded myself that it was not a race, and tried to slow my pace as I snapped away with my camera. I tried to imagine how the wall fortified the Chinese region back in the day. 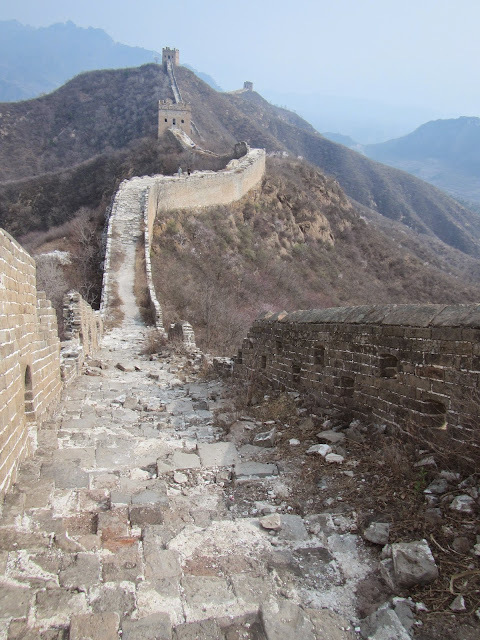 I took the time to read the many information bulletins at each tower, and after powering through the steep section at tower 18, plus finishing the remaining towers to 22, I still found myself the first one finishing. Hmmm, well damn! A few souvenir selling locals took this opportunity to try and sell me a t-shirt and postcard with no avail…no way were they ever going to crack this egg lol. 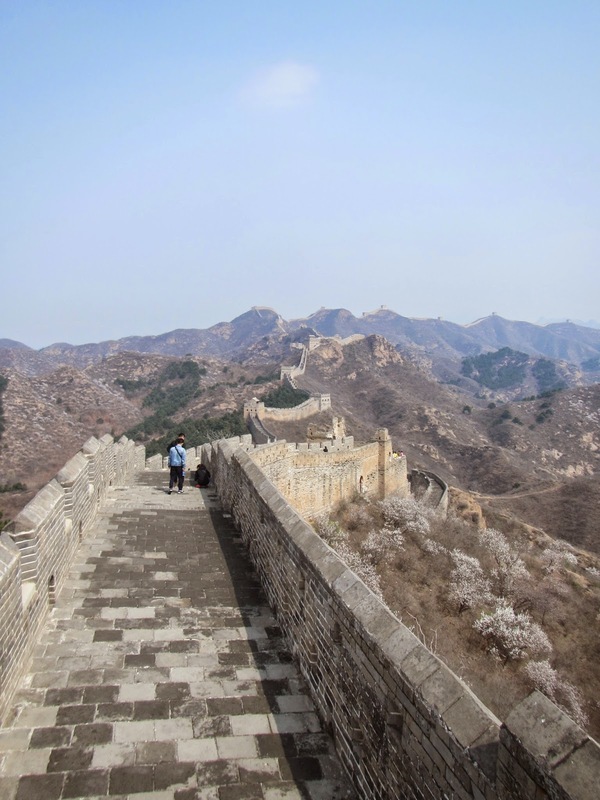 I took one long last look at the miles and miles of wall off in the distance before heading down to board the bus back to Beijing. It was accurate to say the wall was appropriately hyped, and I enjoyed all 3 hours on it. The drive back was much more efficient, and by 7pm, I was dropped off at a subway line two stops away from my hotel. This conveniently allowed me to swing over to the night market for a quick, much needed bite (no, not scorpion this time), before heading back to the hotel for a rewarding 35 yuen beer to nightcap the evening. Today was a good day. I decided I deserved a rare sleep-in, so I stayed in bed till 8am…crazy right! I had a full day to finally take it easy, enjoy the hotel, and wind down before my early flight the next morning. 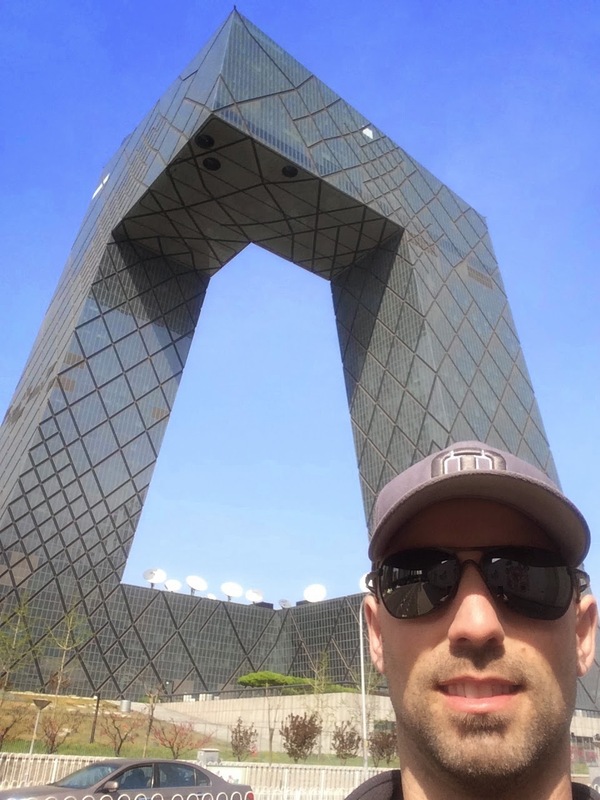 I'm a bit of a skyscraper buff, and no trip to Beijing would of been complete without visiting the cctv tower. I had seen this unique, architecturally designed skyscraper in many pictures, and decided to jump onto the subway for a quick rip over to the downtown region for a brief gander. The tower was pretty straight forward, and after 5 minutes, I had my fair share of the nearby sites. I crossed the street to view the construction that was in progress for Beijings future tallest tower…just another super tall skyscraper being erected in China, no big deal here…but a huge deal anywhere else. I gazed at a few other tall towers in the area before jumping on the subway back to the hotel…it was so effortless, and even addicting, to have a subway within fingers reach... hard to not just casually commute 20km here and there without any forethought. It was barely noon and I needed to occupy a few more hours of site seeing to fulfill my site seeing needs. I made a last minute decision to have a quick look at the olympic plaza region. The "birds nest" was a particularly interesting stadium I needed to see up close. Again, it was only 15 minutes or so on the subway to the Olympic Green stop, so off I went. It was a chilly windy afternoon, and I was under-dressed for the occasion, but at lease the sun was out, or I would of been screwed. The area was huge and spread out. I zipped around the grounds at a quickened pace, snapping picture of the birds nest and the stadium where the swimming was competed at. It was a convenient set up, arriving at one end by subway, and leaving the grounds on the subway on the other end, avoiding any unnecessary loop route. I enjoyed my little side trip, but logged in enough tourist stops, and wanted to rest before my much anticipated peking duck meal I insisted on doing that night. I had a quick nap before taking a much needed shower before my dinner. It was getting dark, and after 20 minutes walking through several back alleys in the dark to the popular restaurant (I can't remember the name for the life of me! ), I reserved my name on the electronic waiting list at 8pm and took my seat in the waiting line. The place was packed, and the waiting list was less reassuring. It was not the most ideal situation to reserve a table as a solo travel, but I was just going to cross that bridge when it came. As I waited, I met a really nice couple from Germany, and a nice couple from Israel. Both contributed to buffering the stagnant time that seemed to go on for ever The wait grew to almost 2 hours until I was told I could have a table…but there was a catch. The deal was for me to join another solo customer. The problem was he was a local who spoke no English. I pleaded to the hostess to join me with one of the couples I had recently met, but they would not budge. Alright then…bring on the awkward engagement. We both ordered peking duck and one side. I got some sort of weird looking bean. No conversation was shared except for one translated phrase from my table mate…"It is very nice to meet you". Yup, Chinese style socialization. Seeing the two of us were sitting at a 4 person table, I waved over the two guys from Israel and asked if they wanted to inquire if they could join us. They were better at persuading the hostess and as a result, I finally had someone to actually talk two…two flamboyant guys who were not scared showing their feminine side as they deeply enjoyed each others company. 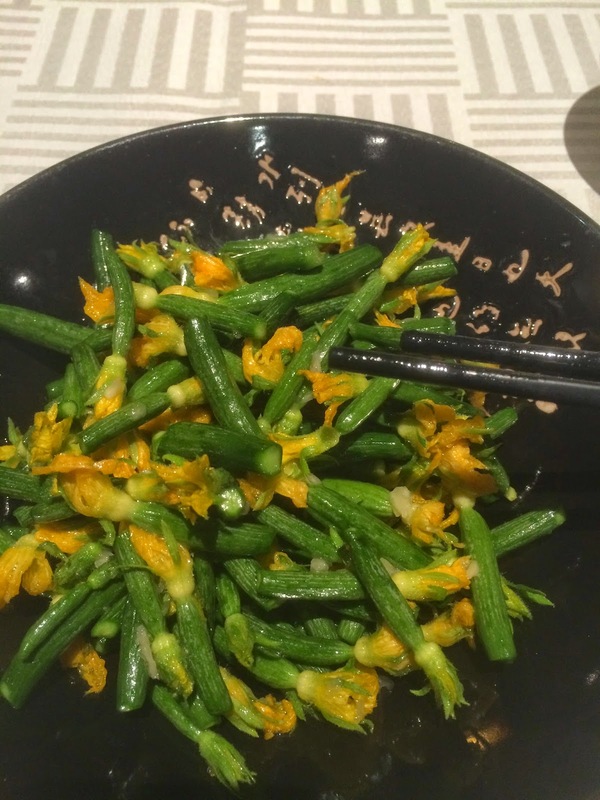 The also didn't have a problem overindulging as they purchased almost 800 yuen of food, which they were nice enough to share with me. 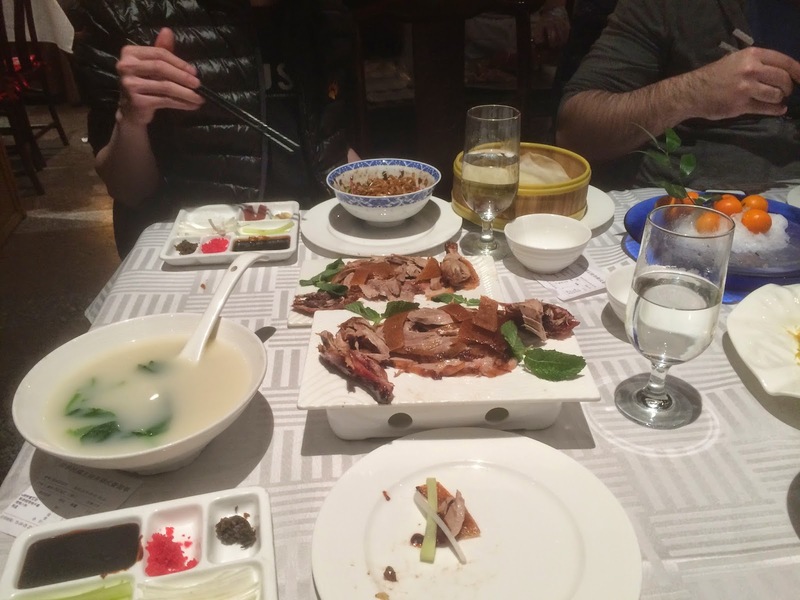 It was almost 10pm by the time I finished my extremely tasty peking duck, and my not so enjoyable duck soup. I said my good byes to the two couples I met and headed back home to pack…tomorrow was going to be a long day with 13+ hours of flight to look forward to. I got all my things in order, grabbed one last Starbucks coffee for my last treat, and jumped on the subway while most others from the hotel lined up for their taxi rides, which I read cost roughly 150 yuen. The subway to the Airport Express cost me 3 yuen, and then another 25 yuen the remainder of the way to the airport. It took less then an hour, and cost me a quarter what a taxi would of, and as a result, couldn't understand why everyone didn't use this mode of transportation to the airport. I unfortunately got off at the wrong terminal by listening to another tourist who guessed all international flights left from terminal 2…nothing like the blind leading the blind. Checking in was longer then expected, but when all was said and done, I was an hour early for boarding, and had just enough time to look over my 300+ pictures I took, pondering the past experiences I had just endeavored over the last 11 days. Safe travels to you, and wishes for many more adventures!